Every voyage on the Clearwater is unique and exciting due to the shifting winds and tides of the Hudson River, the variety of docks we visit, the surprises we pull up in the fishing net and the individuals we bring aboard. We are always able to provide a top-notch educational program, in part, because of the ever-changing learning environment the Hudson River presents. Educators, captains and crew all gain inspiration from the unexpected bird flying overhead, passing river traffic, the ever-changing skyline and the specific interests of our passengers. After forty years of environmental education on the Hudson River, much of Clearwater’s curriculum has been honed to perfection. But within our educational model we have the flexibility to cater to some of your specific interests. We love to focus on a particular theme or topic which you have already been studying or to which you would like an introduction. Please take a look at the following options for themed sails to see if there is one that might be an exciting match for your group. Classic Clearwater Sail: This option allows the onboard educator to design a theme that draws from the strength and passion of the crew teaching onboard that day, local geographic or historical points of interest to been seen during the sail or a current environmental issue developing on the Hudson River. History: (History/Anthropology/Geology) Take a trip through time aboard this historic vessel. Learn about the glaciers that formed this mighty river, the Native Americans who once populated the valley, Henry Hudson’s famous exploration and the other communities who have formed a deep connection with the Hudson River. 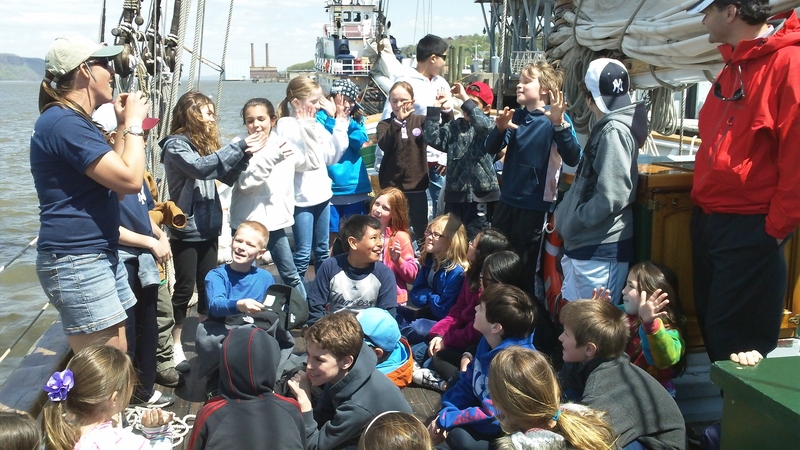 Students look through history and learn who has made their mark on, or been inspired by, the land and waters they can see from the decks of Clearwater. Watershed Ecology: (Ecology/Geography/Community) From the Adirondacks to the Atlantic Ocean, the Hudson River is the path by which people, plants, animals, nutrients and pollutants are all linked. Learn about how the watershed you are sailing on works, what makes it so unique and how you are part of this dynamic ecosystem. Sailing and Transportation: (Physics/Transportation) Learn about how this historic vessel is able to harness the power of the wind to travel up and down the river. Understanding the physics and simple mechanics of sailing a ship are exciting with the wind on your face and the waves rushing past. Explore how transportation of goods on the Hudson River has changed dramatically since the 1800s when sloops like Clearwater dominated this waterway. Art and Music (Art/Music/Poetry) Thousands of people have been inspired by the beauty of the Hudson River and surrounding landscapes. Learn about the painters, musicians and writers who have richened our lives with their creation and exercise your artistic expression onboard the Clearwater, a boat built with music. To see which learning stations and classroom materials are associated with each of these themes take a look at the Overview of which stations will be provided and what lesson plans can help your students prepare.